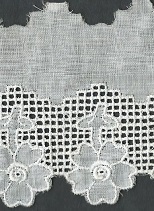 This is a French, Vintage 100% cotton Lace. It is taupe color, 1 1/2 inch wide, 3 yard cuts. 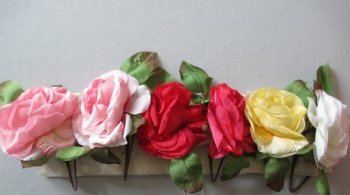 These are very detailed Vintage appliques. They are all cotton, Ivory color, 2" wide, sold in pairs, New. 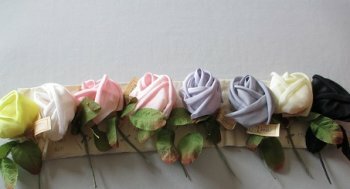 These are French Rosettes with small ribbons. They are 3/4" wide, soft yellow and pink, sold by pair. These are old store stock, new, never used. These are gold metallic, coiled bud flower. They are 1 1/4" tall, sold 4 per package. These are old store stock, new never used. These are metalic coiled bud, with pearls. they are 1/4" and sold 6 per package. This is an vintage croched 100% cotton lace. It is Ecru, 3/4" wide, 2 yard cuts. This is a beautiful Vintage beading lace. It is 100% cotton, Rosie Beige color, 1 1/4" wide, 1 yard cut. This is a Vintage French Embroidered Lace. It is 100% cotton, Ivory color, 1" wide over all, 1 yard cut.